I would like to introduce you to an exciting new men’s prayer group based on the Gospel of Mark’s story of Four Men who brought their paralyzed friend to Jesus for healing. Through their faith they obtained their friends’ healing and the even greater miracle of the forgiveness of his sins. Members of this prayer group seek to continue this by bringing souls to Jesus through prayer and sacrifice. There are no meetings to attend so they are able to fit the five minute a day prayers and sacrifices easily into the very active life of most men nowadays. It is only a men’s prayer group but women can help us tremendously by introducing this group to their husbands, brothers, fathers, sons, and friends and in doing so they will also be bringing souls to Jesus. The story of the four men in the Gospel of Mark is one of the greatest stories of friendship ever. These four men carried their paralyzed friend to Jesus to be healed and they let no obstacle get in their way. They did not let the crowds, the roof, or appearances stop them, but filled with faith in Jesus they lowered their friend down to be healed. Not only was their friend healed, but Jesus seeing the Four Men’s faith also forgave the paralytic his sins which is a far greater miracle. You now have the opportunity to continue this great story of friendship by forming your own Four Men prayer group or joining one. You will bring spiritual paralytics(sinners) to Our Lord Jesus for their healing, conversion, and salvation. These spiritual paralytics need your faith, prayers, and sacrifices to be saved. As Our Lady, the Virgin Mary told the Fatima children, “Pray, Pray very much, and make sacrifices for sinners; for many souls go to hell, because there are none to sacrifice themselves and to pray for them.”(July 13, 1917) Your Four Men prayer group will do something about that and by the grace of God no spiritual paralytic will ever be lost. Jesus said, “If two of you shall consent upon earth, concerning any thing whatsoever they shall ask, it shall be done to them by my Father who is in heaven.” (Matthew 18:19) Your group will not only be two but four who consent to the healing, conversion, and salvation of your spiritual paralytics. "There is nothing more holy in this world than to work for the good of souls, for whose salvation Jesus Christ poured out the last drops of His Blood." (St. John Bosco). Jesus died for these souls and thus He is willing to pay us any price to help Him save them. The price He first pays is to ensure our own salvation. “Whoever brings back a sinner will save his soul from death and will cover a multitude of sins.” (James 5:20). Our Lord Jesus told Saint Faustina, “I thirst. I thirst for the salvation of souls. Help me, my daughter, to save souls.” (Diary of St. Faustina:1032) Rise up today and join the Four Men prayer groups to bring spiritual paralytics(sinners) to Our Lord and Savior Jesus Christ. The Four Men prayer groups involves four solid prayerful men who agree to offer prayers and sacrifices to obtain grace from God for their spiritually paralyzed friends. 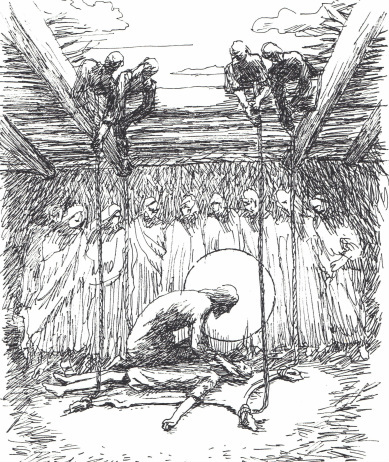 Each member of the group will choose a spiritual paralytic and share the names or pseudo-names with each other. The members stay in touch to share the fruits obtained as well as to keep each other motivated and share spiritual insights. I recommend that if you start the group try to reach out to each member once a month in whatever way is most convenient. Email is great. The group does not have to pray together though when possible it is highly recommended. They do not have any meetings to attend except when they feel called to meet each other at their choosing. Members pray a small set of powerful prayers once a day to obtain graces from God for their spiritual paralytics. The prayers take approximately five minutes so they fit quite well into our very active life . They also offer small sacrifices for their spiritual paralytics such as getting up as soon as the alarm rings in the morning. Once the members are chosen, pick a feast day to start the group. The first Four Men prayer group was started on the feast of Our Lady of Sorrows and all groups have been consecrated to Our Lady of Fatima. The fruits for your group are sure to follow knowing that they are in our Mother’s hands. All of the prayers should be prayed daily before the Blessed Sacrament but sometimes this might not be possible physically. It is however, always possible to pray spiritually before the Blessed Sacrament by placing oneself before the Blessed Sacrament in your mind or by using http://www.savior.org/# The prayers before the Blessed Sacrament will be the mat to carry your spiritual paralytics to Jesus. You will also offer sacrifices to Jesus, praying after each sacrifice, “Jesus, for the love of You, for the conversion of sinners, and in reparation for the sins committed against the Immaculate Heart of Mary.” The sacrifices can be simple things such as not eating the last slice of pizza or doing the dishes without being asked. These sacrifices will be the muscle required to lift your spiritual paralytics on the roof and tear it open. If you believe you have what it takes to become a member of the Four Men prayer groups, one of "God's Marines" sign up today to begin a Forty Day Spiritual Boot Camp. This Forty Day Spiritual Boot camp will give you all the training necessary to become a member of the Four Men prayer groups, "God's Marines". The Four Men Boot Camp will involve a short spiritual reading everyday, praying the Four Men prayer group prayers, and one sacrifice done for the Love of Jesus, the conversion of sinners and in reparation for the sins against the Immaculate Heart of Mary. 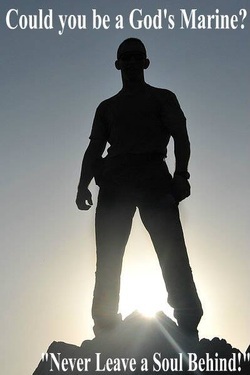 Upon completion of the Four Men Boot Camp you will officially become one of "God's Marines". After that you will be either helped to form your own "Four Men prayer group" or become a member of a group in formation. Once the group you are in is complete with all four members then you will become a member of The Four Men Prayer Groups. May God Bless you in this Great Work, the Work of Bringing Souls to Jesus.